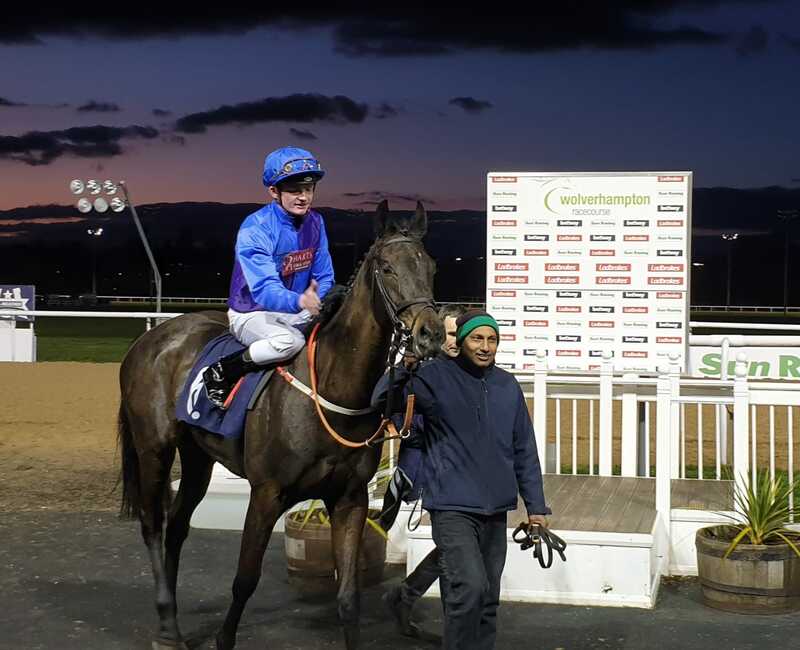 As a half-brother to both Taws and Duke of Bronte, we have high hopes for PRINCE OF HARTS and he did not disappoint by winning on his three-year-old/handicap debut at Wolverhampton on Tuesday evening. Unlike his two useful siblings, he managed to have the full three runs as a two-year-old, showing plenty of promise as well as understandable weakness by finishing fifth at both Salisbury and Bath. Although that final run at Bath came over ten furlongs, in keeping with his pedigree, he can be a free-going type and having showed plenty of speed on the gallops this spring, we felt it was worth starting his campaign over a mile at Wolverhampton. With his jockey Rob Hornby under strict instructions to get him settled in the early stages, he was a few lengths adrift of his five rivals as they entered the back straight. However, he soon caught up as the pace slackened and when switched wide up the home straight, he soon quickened into the lead and ran out a cosy length and a half winner. That came off a mark of just 70 but he’s open to plenty of progress and looks sure to progress again especially stepping him up in trip and we could have the London Gold Cup (Duke of Bronte was fifth off 83 behind Defoe) as an early season target at Newbury’s Lockinge meeting if he wins his next start. We also had three runners at Kempton on Wednesday evening, with MANDOCELLO a son of Motivator staying on very nicely in the closing stages of his debut effort to suggest he has a promising future, PUZZLE CACHE stepping up again as she finished sixth of nine in her third start in novice company and can now go into handicaps while CRYSTAL CASQUE might just have needed her first run of the season as she got tired in the closing stages.